A natural herbal concentrate for the stimulation of Water-element organ function within the Energyvet Pentagram scheme. It acts by means of mild excitation of the lymphatic system, kidneys, sexual organs, urinary and sexual tract, stimulating these organs or tissues towards increased activity. It generally influences the clearing of accumulated metabolites from the animal's organism and it keeps an optimal level of electrolytes in the body. Bio-information of the product-specific homeopathic type complements and potentiates the effect of the included herbs. The product stimulates the function of organs and tissues of the next element, Wood, i.e. the liver, gall bladder, energy metabolism and joints. It calms down excess energy and hyperactivity of the previous element, Metal, i.e. of the skin, lungs, ligaments, and colon. - Arthrosis – joint degeneration [Skelevet]. - It strengthens released ligaments [Skelevet]. - Liver tissue function after infections and intoxications, in metabolic disorders [Imunovet]. - Gall bladder function, dissolves gallstones [Fytovet]. - Bone ossification (controls the absorption and deposition of minerals) [Skelevet, Omegavet]. - Nucleic acid metabolization (eliminates uric acid). - Diarrhoeas, intestinal catarrhs [Probiovet, Cytovet]. - Skin inflammations, rashes, hives, seborrhoea, skin fever [Audivet, Imunovet]. - Outer ear inflammations [Audivet, Cytovet, Imunovet]. - Inflammations of the lungs accompanied by cough and fever [Imunovet]. - Inflammations of the tendons, joint capsules, pleurisy [Skelevet]. - Allergic conditions (necessary preparation with Regavet) [Imunovet]. - Reduces pathological sadness [Fytovet]. Herbal extract 82.6% (Verbena officinalis, Calluna vulgaris, Solidago virgaurea, Artemisia dracunculus, Erigeron canadensis, Ribes nigrum, Arctium lappa, Bidens tripartita, Polygonum aviculare, Sambucus nigra, Tropaeolum majus, Epilobium parviflorum, Filipendula ulmaria, Geranium robertianum, Ononis spinosa), sorbitol – thickener, microcrystalline cellulose – thickener, water, xanthan – thickener, grapefruit extract – preservative, potassium sorbate – preservative, mixture of essential oils 0.12%, bio-information for Renovet. Shake well before use! In older animals the product should be administered only for 2 days, followed by a 3-day break. If symptoms do not deteriorate, only then continue to administer for up to 3 weeks. This will prevent a temporary deterioration of health – reverse reaction. 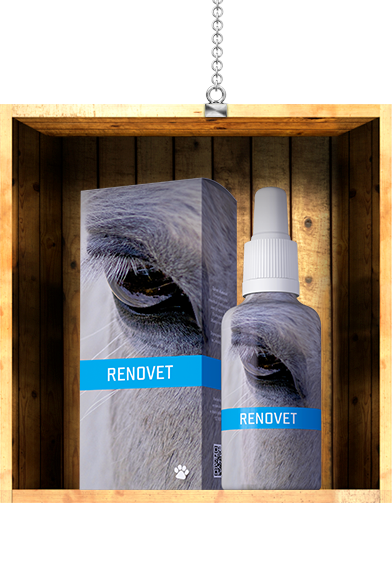 In older animals it is advisable to start with regeneration preparation with Regavet first and only after a one-week break begin to apply Renovet. For precise targeting of the regeneration process it is recommended to seek professional advice. Do not administer if kidney impairment is present or to animals in poor state of health (which may involve kidney impairment). Do not exceed the recommended daily dose! Ensure sufficient intake of water in the course of product usage. Not suitable for gestating females. Keep out of reach of children! Do not administer concurrently with Regavet and/or without at least one-week break between these products. I use Renovet for joint arthrosis (together with Skelevet), for water metabolism problems – profuse watery diarrhoeas, cold oedemas, as well as conditions accompanied by tissue swelling, and in the treatment of allergic conditions (alternately with Regavet, switch-over after 4 weeks).